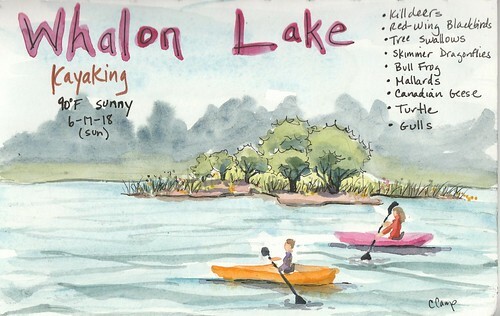 On Lake Whalon Watercolor – Let's Paint Nature! My kayak glides on the water, like a feather does carried by the wind. I drift along the shore of a tiny green island. A killdeer stares me down not moving an inch. I tempt my fate and move in closer. We are just 4 feet apart. Still in a staring contest, I study his bright white and black collared neck. Suddenly, he paces along the shore. First left, stopping to bob, then right, stopping to bob. He is looking for a meal. Another killdeer cries and flies away. Swallows swoop and scoop the water just inches away from my kayak. Dragonflies dart in front of me. Floating ducks take off by flapping their wings and running on the water. I feel as if I am one with both water and wildlife. Amazing. Thanks Mark, yes… it’s as if the dragonflies are playing with us! How lucky we are. Hope all is well with you too.